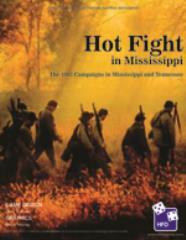 Hot Fight in Mississippi is a wargame simulation of the campaigns in the West 1862 near the towns of Corinth and Iuka. Confederate Generals Sterling Price and Earl Van Dorn operated separate commands in northern Mississippi, late in 1862. 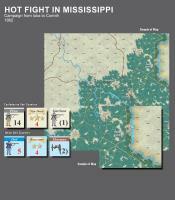 Union troops, in a disjointed attack, struck Price near Iuka. Price withdrew, while at that same time Van Dorn made a move toward Federal held Bolivar, but then backed off. Van Dorn eventually gained command of Confederate forces in the area and united with Price. Van Dorn believed a quick move to take Corinth was the best way to proceed. US forces under General William Rosecrans were fortified in Corinth however, and the assault, though with some initial success, was costly to the Confederates. Van Dorn then withdrew to Holly Springs. But there were other options available to the southerners. Forcing Union forces to abandon Corinth by outmaneuvering them and blocking their supply routes was one alternative. Striking towards the important bases of Bolivar and Jackson was another option. Or attempting to take Memphis was a possibility. Then again, what if things had gone differently, and the US had been defeated at Corinth. The possibilities are now yours to explore.